The General Assembly debate at the United Nations is underway. The Latin American leaders consistently voiced their views on the economic crisis wreaking havoc on the Latin American peoples’ human rights and human development, both ecologically and economically. The very issues that the UN as a whole is supposed to address worldwide. Let’s have a look at some of the key leaders and what they had to say. SPEAKER: Overcoming poverty, dear friends, is the greatest moral imperative for this planet. Since the first time in the history of humanity, poverty is not a fruit of scarcity of resources or other factors, but rather due to exclusion, which is a fruit of the twisted power structure. SPEAKER: There have constantly been wars of aggression and interference in internal affairs of the state. We have witnessed the ousting of sovereign governments by force. The so-called soft coups and the recolonization of territories. And all of these upgraded with new, ingenious actions, employing new technologies and under the pretext of alleged human rights violations. SPEAKER: Wars continue. Invasions continue. And what is the origin of these wars and invasions in various continents? Ambition of certain regions, certain nations. The policy to keep capital in the hands of a few, in certain states where oligarchies dominated, supported by the transnationals, the international companies. And therefore I feel that after 70 years since the creation of the UN we have not achieved the goals that were achieving peace and stability in the world. PERIES: To discuss these points that were made at the UN and more I’m joined by two guests. First joining us from Guatemala City is Andrea Ixchiu. Andrea is an indigenous journalist from Guatemala. She works with the Guatemalan independent media organization Prensa Communitaria. Joining us also from Washington, DC, is Alex Main. Alex is a senior associate for international policy at the Center for Economic and Policy Research where he focuses on U.S. foreign policy in Latin America and the Caribbean. Alex, Andrea, thank you both for joining us. ANDREA IXCHIU: Hi, thanks for this space. PERIES: What are the most illuminating points that were made among the Latin American leaders, from your point of view? IXCHIU: Well, I may say that I can find some contradictions in what was going on in this global summit. I can say that we have seen more dark spots than light ones in Guatemala. Especially because we don’t have a president at the UN meeting this year. The vice president attended. And they start saying that we have been getting over the crisis, and that’s totally a lie in Guatemala. We are just having a transitional government, doing this a few months, and we are still having elections. So I can say that the crisis is over, and in my point of view the discourse was a little bit tricky. The only good thing that we can point about it is that the struggle against impunity has already started, and that’s the only good thing that we have to say to the rest of the world. While hearing a lot of other leaders I can say that I do have a lot of respect for a lot of the South American leaders that are actually trying to change some of their policies to actually distribute the richness, the wealthiness to all the population, not for certain elites. So that’s interesting, and that’s also a big challenge to take to the rest of the countries, especially in Central America. PERIES: Alex, Raul Castro and president of Ecuador Correa both spoke very eloquently about the charter of fundamental rights, and the fact that the world has not fulfilled those rights, and that those human rights and economic rights just remain the utopia still for most of the people around the world. What do you make of that? MAIN: Absolutely. And I think that fits in with the discourse of a lot of the new Latin American left leaders, and there were others like Evo Morales and Cristina Kirchner that raised some of the same issues. So I think one of the standard practices in this UN General Assembly was at the beginning to sort of recognize the 70 years of the UN and talk about the UN Charter. But the strongest critique of the non-application of some of the basic principles of the UN Charter came mostly from Latin American countries where you’ve found–I mean, today you have sort of the most outspoken leadership on sort of southern developing country issues. And they don’t mince their words, that’s what’s particularly impressive. And with Castro and Evo Morales, and Rafael Correa, they begin by talking about the UN Charter and how wonderful the principles are, and how, you know, there’s been really no progress and in fact things have gone in a backwards direction since 1945. More people are hungry, more people dying of curable diseases. Global military expenditures, and this is one thing that Castro and Evo Morales both raised, reaching nearly $2 trillion a year. And obviously there are all these huge problems facing humanity, and the money could be better spent on dealing with the problem of climate change and poverty and so on. And you know, these leaders also engaged in a real sort of structural critique that you don’t find, I think, in other speeches where they discussed how the problem of social injustice is very much linked to the problem of war, conflicts, and climate change as well. So some very interesting things in these speeches. PERIES: Now, Alex, as far as the UN is concerned, you and I in the past, our previous life, we had the opportunity to prepare President Chavez from Venezuela from these meetings. And one of the really great things about these meetings is that various presidents make some profound comments, and particularly on issues related to the structure of the UN, how undemocratic the process is and how it actually fails its Charter again and again and again, and those who are more powerful, stronger at the UN is able to flex their muscles and have more say at the UN. But year after year these comments are made and nothing really happens. But I think what’s really interesting this year is particularly President Correa has taken up this issue of addressing development and the mission and the goals of the UN in a more regional way. I’m wondering whether you can comment on that, first Alex and Andrea. MAIN: Well yeah, I think–you know, Correa’s speech is definitely worth looking at. You know, for the most part speeches at the UN, at the General Assembly, are absolutely dull and predictable. But again, you know, in Latin America it’s a bit different. And unfortunately the media completely overlooks this, unless you have someone like Chavez, as you do back in 2006. I can’t remember if it’s 2006 or 2007, but calling George W. Bush the devil. SPEAKER: I think that the first people who should read this book are our brothers and sisters in the United States. Because the threat is in their own house. The devil is right at home. The devil, the devil himself is right in the house. MAIN: They don’t do something, you know, very flamboyant like that, and they are completely ignored. But indeed, I mean, they’re calling for a lot of changes to the UN. I think there’s a real consensus, and you see this throughout the Latin American speeches for at the very least an expansion of the UN Security Council. A few leaders objected to any country having a veto in the Security Council. And then of course some leaders, like Evo Morales, are sort of against this whole concept of a Security Council since this creates a system where some countries are more equal than others. The hierarchy where powerful countries with nuclear weapons have a say over the other 180 countries and international policy directed towards them. I think a very interesting thing as well was a discussion that came from a few of these leaders on how the Charter should be extended to other rights. And they kind of used Pope Francis to back up some of these ideas. Of course, Pope Francis was in Bolivia and Ecuador a few months ago, spoke to social movements there and defended the idea of land and lodging and work being basic human rights. And so these leaders take those up as well. Rafael Correa goes as far as talking about the rights of nature. And this is something that’s of course embedded in the Ecuadorean constitution. It’s a concept that I think is relatively new in the area of international law, I don’t think it’s been quite assimilated in the West, but a very interesting one. And one of course that’s also defended by the government of Evo Morales. PERIES: And Andrea, jump in on this. Your understanding of what was said at the UN and the UN as an effective body, as far as the region is concerned? IXCHIU: Well, I can say that I was kind of concerned about how some of the political leaders, especially Latin American leaders, some of them have very progressive speeches and do very several critiques to the Security Council, to the development goals. But we have seen some contradictions in between the way we have, like, a constitutionary recognizement of nature in some South American constitutions. But we still have seen the repression against indigenous communities. We have seen, like, big [marches] of indigenous protests have been evicted, and also criminalized, by some of the presidents, as Rafael Correa. So that’s where I found the contradictions inside the UN. Not just the UN as an institution, but as part of how we are still having this kind of state structure that are made to always be inequability in between countries, in between populations, in between communities. So we have seen that the actual regime, like states, doesn’t recognize the autonomy of the indigenous communities, and also for small populations. Something that I want to talk about, it’s the importance that I have found in some of the speeches of some of the leaders that talk about immigration as a human right. The importance of immigration as, in front of this crisis, of immigration that has been criminalized in not just Latin America. Also in Europe, in Asia. So that’s really important to start to talk about. I’m still concerned about the fact that there’s always more power to men and less participation of women leaders in all these meetings. PERIES: And Andrea, unpack that bit. 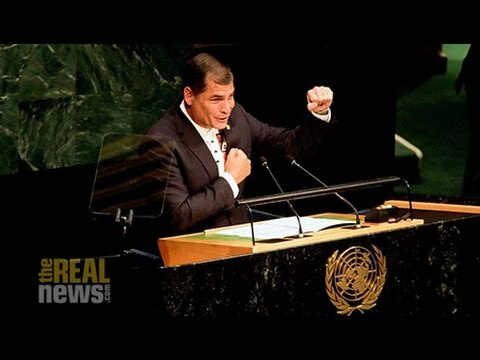 You just launched a critique on President Correa, and one of the things that we actually don’t hear at the UN when mainstream media covers these issues is often when a president is speaking there’s often contention from sometimes his own country, and activists and organizations that are also there opposing or challenging what a president is saying. You were highlighting these contradictions. Elaborate on President Correa, what he said and what he’s actually doing in Ecuador. IXCHIU: Yes. That’s why I say that there’s always a contradiction in the leaders. Because some of them can be really capable and really smart. And they are also implementing interesting regulations to their countries. But we have seen the contradictions, it’s not just only of the leaders. It’s about the structure of the system, the structure of the states, that in some way are always afraid to recognize the autonomies of indigenous communities. So we have seen that in Ecuador, when some of the indigenous communities are struggling inside of the country to ask for recognition of their rights, and they have been criminalized by the government. So that for me is always a contradiction. Like, I admire the way that Rafael Correa has been changing some of the economic structure, but I do not agree the way he has been criminalizing indigenous struggles. And saying that the indigenous struggles are part of a destabilization of his government and that they belong to the most conservative groups, which is not true. So that’s why I always find interesting to see and hear them talking about the human rights in the UN and about the highlights of their government. But we also, as part of the communitarian press, not also in Guatemala, we are linked to another communitarian press in Ecuador. We have seen the contradictions in between the speeches of the governments and what their realities are happening in their countries. PERIES: And Alex, let me get you in on the issue that Andrea raised, which is on the issue of immigration. Now, the immigration and refugee crisis around the world has been highlighted, of course, in the sense of people fleeing the conflict in Syria and Iraq, and really northern Africa as a whole, flooding both economic and war-torn areas and coming to Europe, and that’s what we are seeing in the press. But even more important in terms of Latin America is really the refugee and immigration crisis across the border of, between the U.S. and Mexico. I’m wondering whether you can comment on whether this was raised as an issue by some of the leaders, and what they say might be the solution to the crisis. MAIN: Well yeah, absolutely. I mean, a lot of the leaders spoke about the refugee problem in Europe. But speaking from a view very much informed by the migrant crisis that we’ve seen in Latin America, and particularly Central America, of course, coming from the Northern Triangle, Guatemala, Honduras, El Salvador. You know, I think there’s a consciousness of the sort of similarities, and the fact that this is conflict driven, and also driven by a world system that is really deepening inequalities, particularly in the developing world today. And this is something that they spoke about. In fact, Rafael Correa sort of made a good point about the hypocrisy around the whole free market discourse, where there’s free movement of capital that’s very much encouraged and promoted by the U.S. and European countries, but at the same time they’re completely blocking the movement of labor, of people, of individuals. And when they’re seeking better lives elsewhere, then the free market sort of mentality no longer applies, so I think that’s interesting. But I’d also like to sort of respond, react a little bit to what Andrea just said regarding this sort of gap between the discourse, the progressive discourse in a lot of these speeches and then the reality on the ground. And I think, you know, she’s largely right. But I think there’s also something that is raised by a number of these leaders, particularly Evo Morales and Rafael Correa, where in both countries you’ve seen some amazing development occur, where thanks to very functional economic development policies you’ve had wealth in the countries that’s grown enormously, and it’s been fairly well distributed. A lot of people have been pulled out of poverty and so on. I think on the whole the lives of people in these countries are much better than what they used to be. And yet you do have these conflicts that occur. But I thought that Rafael Correa kind of framed this very interestingly in terms of how the so-called developed world seeks to impose certain sacrifices on the developing world. So the developing world that is trying to follow the model of the so-called developed world today, and sort of industrialized and so on, just as the developed world has done, they’re trying to use their natural resources to expand their national wealth. And at the same time you have countries of the global North that are telling them you’ve got to stop doing that because we have to save the world, we have to deal with climate change, and so on. Therefore we’re asking you to make major sacrifices and bring down your level of emissions, and so on. And at the same time this sort of blockade against developing countries where intellectual property rights that are so important in the knowledge economy, it’s a major thing today, is something that’s just not accessible to developing countries. All the patents come primarily from the U.S. and Europe, and are heavily, heavily protected from years and years, preventing that sort of access. So you have a fundamental structural injustice that’s keeping the developing countries in their current state, and they’re being asked to make these sacrifices. So I think they justly, both Evo Morales and Rafael Correa say, you know, fine. We will protect our environments, and we’ll cease exploiting some of the natural resources and thereby sort of allowing our countries to prosper. But then you have to compensate us somehow for doing that. And I think that’s a very, very fair sort of appeal that they’re making. If they’re going to make sacrifices that are going to prevent them from developing then the northern countries that are largely responsible for the mess we’re in in terms of the climate today should pay up. PERIES: Andrea, your final thoughts on the particular issue of climate change and the impact that’s having on indigenous communities throughout Latin America? IXCHIU: Yes. Well, I would have to say that for us especially a concern, we cannot see a way to build well development and sustainable development over the dead bodies of the human rights defenders, over the dead bodies of our leaders that have been killed and martyred for being–defending their lands and their rights over the industrial companies and destructive projects. So that’s the thing, that we don’t want to build sustainable development over the impunity in our systems, over the eco[sites], over the transnational enterprises that are going, exploiting the earth all over the world, and they never are responsible for the damage that they have done. And in some facts, so the complicity of the governments, that in a lot of countries, especially in North America, will put laws that help the transnational enterprises to do destructive projects and not defend their own population. So that’s why for me, actually really interesting the way now the UN has been turning out to talk about sustainable development and start asking the most wealthy countries that they have to start to change the way they live and the way they consume. So that’s the only thing that I want to highlight. Like, for indigenous communities, and especially the communities that were represented at the indigenous council at the UN, we have been saying for the past 20 years that we don’t want, and we don’t believe, that sustainable development has to keep being constructed over our lands, over our resources, and over our bodies. PERIES: Andrea Ixchiu, Alex Main, thank you so much for joining me today. PERIES: And thank you for joining me on the Real News Network. Andrea Ixchiu is an indigenous Maya K’iche human rights activist and journalist from Guatemala. She works with the Guatemalan independent media organization Prensa Comunitaria.